Tutoring success stories: We've all got them. Sometimes change is incremental, and sometimes we get those "ah-HA" moments that keep us going. Have fun sharing your stories and reading about others' experiences here. Don't be shy! Tutors, Do YOU Have a Tutoring Success Story to Share? Tell about a time you enjoyed a tutoring success, large or small. How did you help a student learn? How did you become a better tutor? Share your story here! Your story will appear on a Web page just as you enter it here. Include a photo of yourself and your contact information or web address if you'd like. Would you like to include a photo of yourself with your post? Great. Click the button and find the first one on your computer. Select it and click on the button to choose it. I CAN READ, I CAN READ! Here's one of my favorite examples of using an individually tailored approach to make tutoring successful. 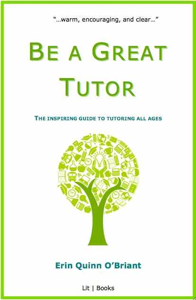 It also appears in my forthcoming book, Be a Great Tutor. "Erin's student Fred was a bright fifth-grader whose parents felt his handwriting, spelling, and other mechanical skills needed improvement. She knew the only way he would get better was to practice writing, but he didn't want to. Drawing on her background in creative writing, Erin decided to make the sessions as fun as possible for Fred. They spent a couple of hours inventing characters, drawing pictures of them, and listing their personality traits. Erin incorporated Fred's science homework by using his textbook to find pictures of Fred's favorite animals. Fred's favorite was a young pufferfish named Caesar, and soon Fred was eagerly writing page after page of a detective story about Caesar. Erin let him enjoy his writing most of the time, but stopped him once in a while to discuss ways he could strengthen his mechanical skills. By the end of the year, he'd made a lot of progress and had discovered that he loved writing.